1) Using the (Insert > Worksheet) menu. 2) Using the Worksheet Shortcut menu. 3) Using either of the shortcut keys (Shift + F11) or (Alt + Shift + F1). The worksheet will always be inserted before (or on the left) of the currently selected sheet. The default name given to the new worksheet is the word "Sheet" followed by the next sequential number. You can alternatively use the Worksheet shortcut menu. 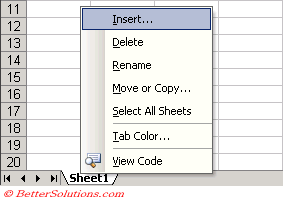 Selecting a sheet tab with the right mouse button will select the sheet and will display a shortcut menu. This will display a dialog box allowing you to choose the type of sheet you want to insert either a worksheet or a chart sheet. Any sheet selected from this dialog box will be inserted "before" the currently active sheet. Worksheet - Inserts an empty worksheet. Chart - Inserts a chart sheet which can be used to display single charts. 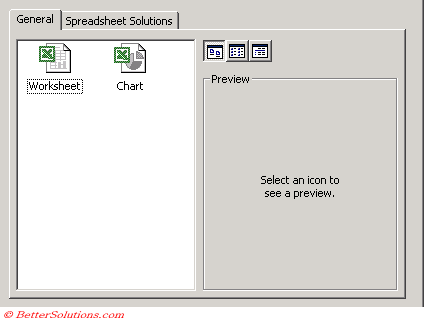 It is possible to insert an Excel 4.0 Macro sheet, Excel 5.0 Dialog sheet or a Macro sheet although these are only available for backwards compatibility and should not be used. It is possible to insert multiple worksheets at the same time. Select the same number of sheets as you would like to insert before selecting (Insert > Worksheet). Excel will insert the same number of sheets that have been selected and they will be inserted in front of the first sheet in the selected range. Any sheets you insert are always inserted before the currently selected sheet. (Alt + Shift + F1) - Inserts a new worksheet. You cannot use (Edit > Undo) command to remove a worksheet once it has been inserted. You can quickly remove the active sheet by selecting (Edit > Delete).